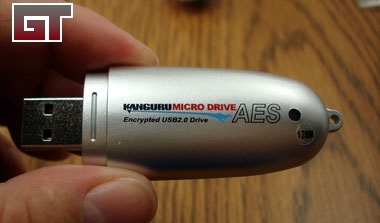 Kanguru sent over one of their AES Micro Drives for review, so let's take a look at it! 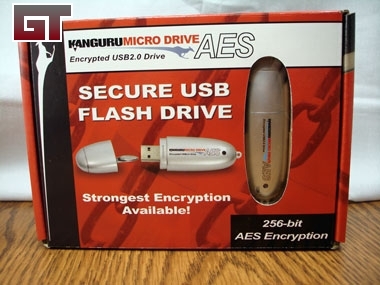 The big selling point for this drive is Kanguru's support of 256-bit AES encryption, making this the first drive to meet federal requirements for insuring the confidentiality of sensitive data. Working in the health care field, I have spent a lot of time on the HIPAA (Heath Information Privacy Accountability Act) so I know how important it is to keep private information as safe as possible. The obligatory box shot before we dig in and see how this drive stacks up. 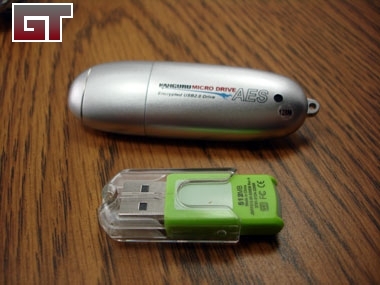 The size of the drive sent to us is only 128MB, not very big by today's standards, but fine for most small files. Only 3 incehs long, Weights only 18g! Withstands up to 1000G Shock! Available in capacities from 128MB to 4GB! 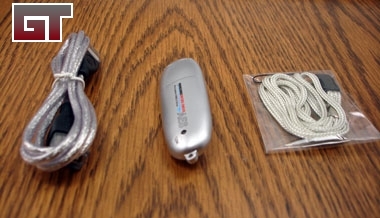 On to looking at the contents of the box: We have a USB extension cord, the Micro Drive itself, and a neck lanyard. 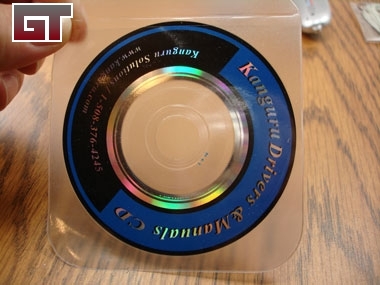 You also get a Mini-CD with the software on it. This includes the Windows 98 drivers, KanguruLock_setup_v1.0.4.7, and a quickstart guide in PDF format. The drive does have a small switch on the side to manually lock or unlock the drive. This is a good idea if you don't want to delete your data by mistake! I placed the Kanguru next to my personal Lexar Firefly for comparison. 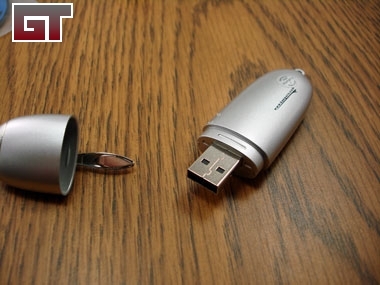 The 3-inch size includes the cap, and it is easy to find in a pocket with keys. It's also very light, which is a nice thing, but the case is quite large and might block adjacent USB ports. 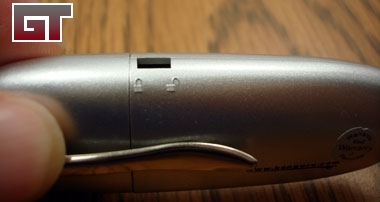 The cap pulls off the Micro Drive with a normal amount of force and shows the male USB connector. As we get ready to test the drive out, I plugged it into the extension cable so that I can have the drive sitting on my desk and not in back of my computer. 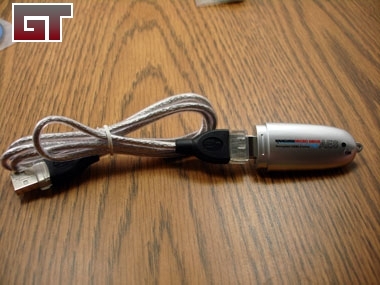 The extension cable also keeps the drive's width from being an issue.